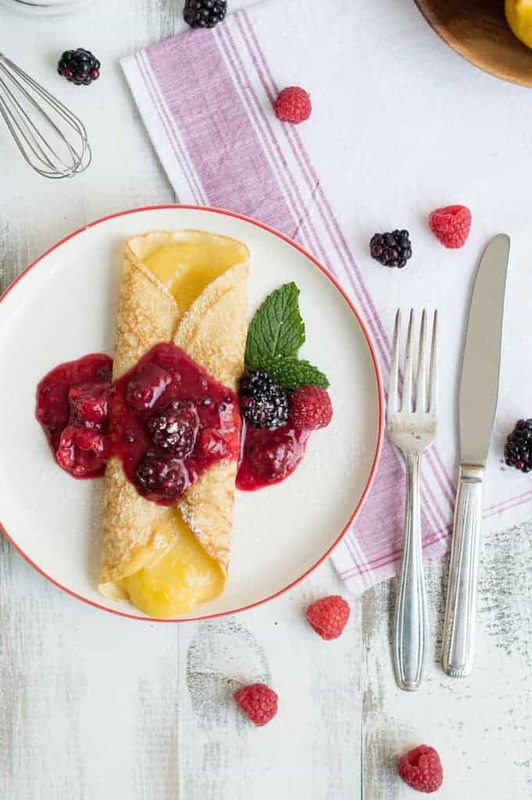 French Crêpes With Lemon Curd & Fresh Berries are a sweet and indulgent treat. 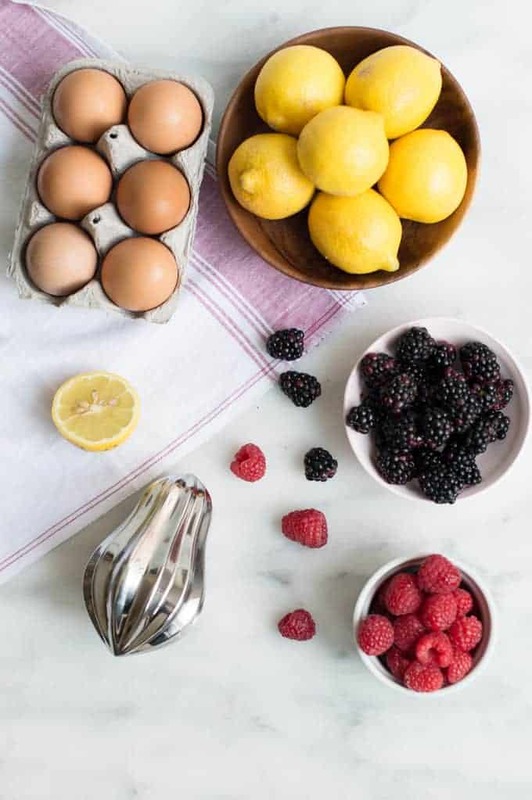 Fresh berries and tangy lemon curd make for a delightful combination, for breakfast or for dessert. Jackie has always been a crêpe addict, and I enjoy making crêpes to feed her addiction. I have created many variations for her, both sweet and savory. This one is a special treat that I am particularly fond of. It is funny, because our original crêpe recipe that we posted in the early stages of Superman Cooks was one we were so proud of. We thought the pictures were so amazing. Now it is two years later, and my, how times have changed! 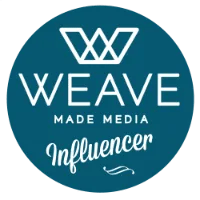 At the time, we were new to the blogging experience, but we always believed in the strength of our recipes and our ability to build a following. Jackie spent many hours teaching herself the ins and outs of blogging, and she devoted tons of time to improving her photography. I am biased, but I think she has done an amazing job. Most lemon curds take a while to make, allowing time for the ingredients to cook and to set up. 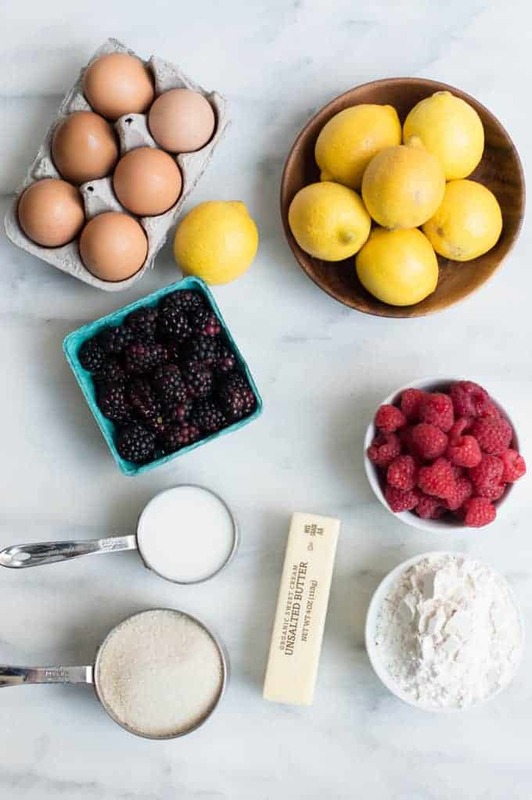 For our French Crêpes with Lemon Curd & Fresh Berries, I wanted a to create a lemon curd that could be made quickly, yet maintained all the flavor of one that cooked for hours. This took a few tries, but I finally arrived at a recipe I believe hit the mark. 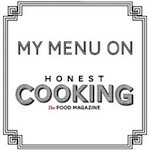 It is tart, flavorful, and has the right consistency. I liked it so much that I think I ate half of it while it cooked! It was so good that licking the spoon became a ritual (don’t worry, many disposable spoons were used in the process). Macerated berries marry perfectly with the lemon and make this dish taste fresh, sweet and irresistible. It is great for summer but perfect to eat any time of the year. In this recipe, we used the beautifully designed Bulb Citrus Reamer (pictured above), sent to us by our friends at Magisso. We love it when fashion meets function. You can order your own at Abode New York. 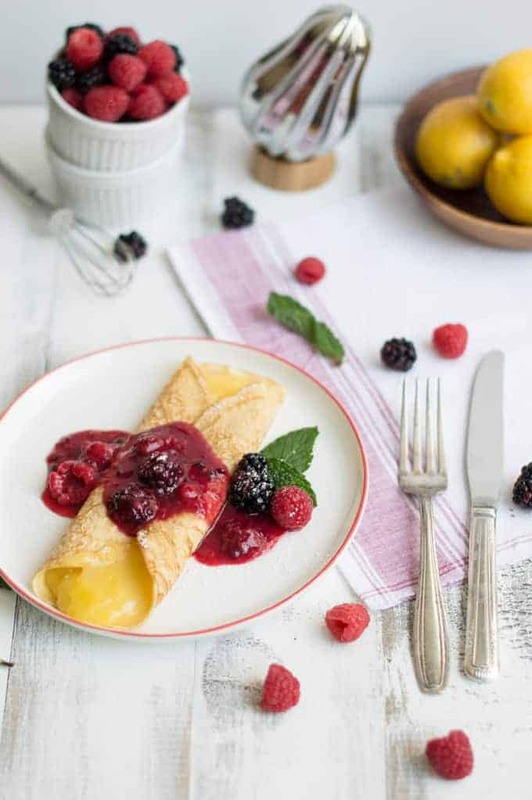 A traditional french crêpe with a summery lemon curd filling topped with macerated berries. In a medium sauce pan, combine lemon juice and sugar and stir until sugar is dissolved. Add lemon zest, egg yolks and butter and cook over medium heat until thickened, stirring constantly for about 12 minutes. Transfer to container and place in refrigerator (mixture will continue to thickened as it cools). Use a 7-9 in non stick sauté pan. Add the salt, melted butter and vanilla and combine (batter will be thin so don't worry). Heat pan over medium high heat and spray lightly with a cooking spray. Drop batter into sauté pan by ¼ C and swirl pan to spread batter to edge of pan until completely covered. Cook for about 2 minutes until browned and sides pulled away from sides. Flip and cook for an additional 45 seconds. 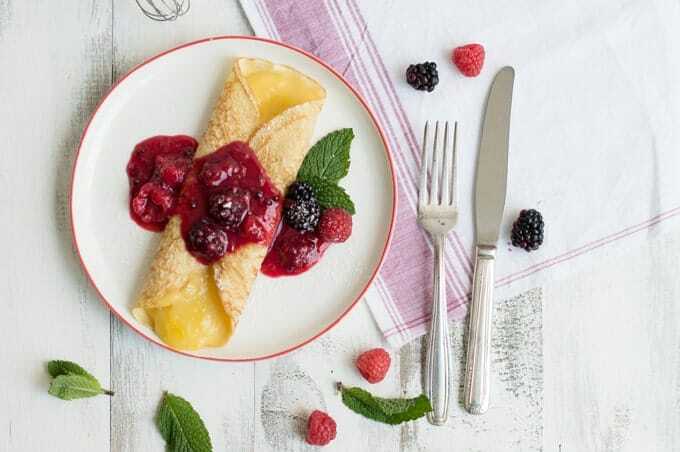 Remove and place on plate and continue to make crêpes until all batter is gone. Place berries, water and sugar into a small sauce pan and cook over medium heat for 4-5 minutes. Remove from heat and cool in refrigerator for 10 minutes. 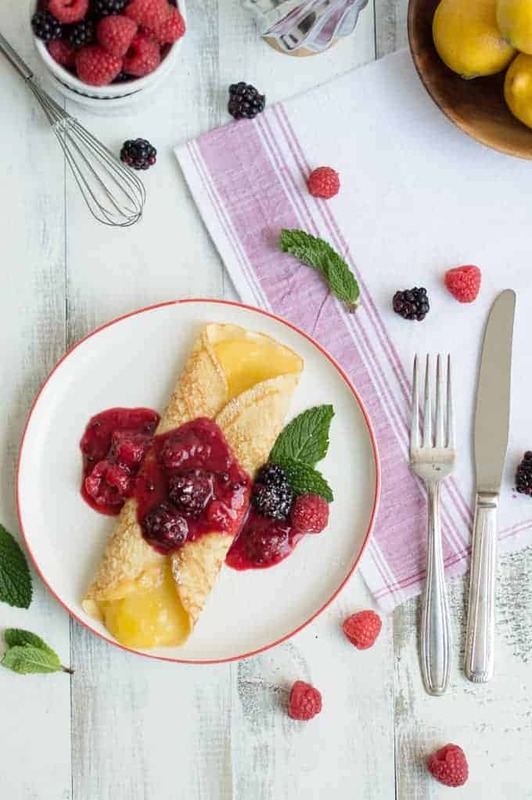 Take crepe and spoon 2 tbsp of lemon curd on crêpe and fold in thirds. Top with berry mixture and enjoy. These look heavenly Keith! Light, summery and refreshing!